Superman continues to review his own history at the Fortress of Solitude. He remembers his first days at the Daily Planet, the villains he faced, the day he proposed, the day he revealed his identity to Lois and his battle with Doomsday. He also relives the death of his adoptive parents, when Lois told him she was pregnant and how he and Lois went into hiding soon after the birth of Jonathan. After recalling more recent events, including his encounter with Mxyzptlk, Superman finally sees the owner of the mysterious voice that has been talking to him while he went over the events of his life. It's Mr. Oz, who warns the Man of Steel that the threat he faces are beyond him alone. Superman flies away from the Fortress assuming that all of his friends and family are threatened by an enemy he knows nothing about. Meanwhile, the mysterious hologram revives the Eradicator on the Moon and convinces him to join the hologram's team. They are joined by Blanque and Metallo and the hologram reveals himself as Hank Henshaw and welcomes them to the Superman Revenge Squad. Story - 5: There's a lot to unpack in this issue so I won't waste any time with a tedious preamble. The new history is in place and for the most part I love it but there are comments to be made and questions to be asked now is the time to do so. Let's start small and go from there; Jurgens threw in a lot of little touches that I really dug. I hate Steve Lombard with the fire of a thousand burning suns but Jurgens made his brief appearance work for me. Seeing the various Post Crisis costumes of Superman like the Electric Blue outfit or the more gladiator inspired look he had briefly in EXILE was great as well. 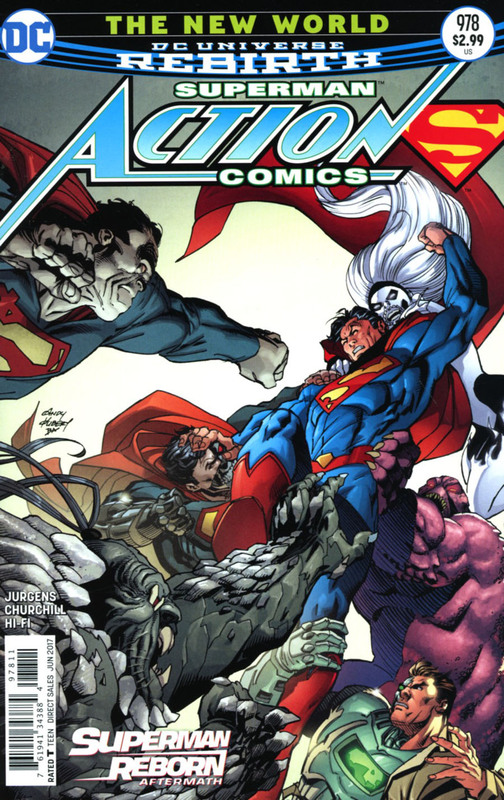 I wasn't surprised that the DEATH AND RETURN OF SUPERMAN was referenced but it was a little disappointing that Superboy wasn't part of the line-up of Supermen that showed up after Clark died. Part of me understands this but another part feels like room could have been made for him at the table. Then again this is DC and change is always possible so he might show up yet. The major revelations happened towards the middle of this issue. Lois and Clark did go into hiding around the time of Jonathan's birth but now it was because Lois had exposed a ring of arms smugglers. They lived under assumed names in California and both Clark and Lois continued their work in secret, so the best parts of LOIS AND CLARK still happened. Eventually they returned to the Daily Planet and we see a brief shot of Superman fighting with Ulysses, so between that and seeing the New 52 costume that era hasn't been completely swept under the rug, which I thought was a smart way to go. Even though those stories didn't happen exactly the way they played out in comics that were published they haven't been wiped clean from the face of the Earth. They've done that sort of thing twice in Superman's publishing history and while I love the Post Crisis era I do recognize that nuking and paving over the past will only serve to alienate a percentage of the reading base. I was not the biggest fan of the New 52, but that Superman did have readers that liked him so it feels like DC is finally trying to make everyone happy. They won't. That's the nature of fandom. But they're trying and that's significant. The biggest winner in this new history is Lois. Jurgens writes her as a strong but likable character that has no truck with bullies and is willing to do anything to get the story. The scene with Steve Lombard trying to play a prank on Clark and her shutting it down before Clark finds his own way out had me grinning ear to ear because those types of scenarios are what make reading Bronze Age comics annoying at times. More than anything that small bit of narration where Superman admits that Lois probably knew that he was Clark before he told her shows that Jurgens respects this character. In a way, it gives her more depth because here is a woman that is in love with a man that is keeping a secret from her but instead of resenting that fact she realizes that he's spent most of his life hiding who he is from the rest of the world and waits for him to be ready to tell her. It works so well because it gives us the more modern take on their relationship without saying that the way they did it in the past was silly and stupid. I wasn't down with every change and tweak. The Kents dying made me a little sad but I do realize that one of the main reasons to have them around was to give Clark a place to come home to. I'm not suggesting that having Lois and Jonathan makes them redundant but there was something to be said of their deaths acting as the most important lesson Superman will ever learn; he has all of these powers and he couldn't even save them. I loved the various iterations where the Kents were alive but I also have enough sense of the character's history to know that there were decades where the Kents died right before Clark left Smallville. It was always a bit of a cheat because they were alive and well in the Superboy strip, so Pre-Crisis fans did get to have it both ways but if you are going to draw from every version of Superman to make a new one then you can't stay too long in the Post Crisis era. It would be disingenuous. The one thing this issue didn't address because it's an ongoing bit of business was the fact that changing Superman's past also changes the history of the current DCU. The Five-Year Timeline is gone. At the very least Superman has been operating for fifteen years, so this whole idea that the heroes need to be younger has been thrown away. He was never with Wonder Woman, so all of those sorts are rendered null and void. If there isn't a dead New 52 Superman did Lex ever put on a suit of armor and try to take Superman's place? When you really start thinking about it the implications of these changes are massive and I look forward to seeing how that plays out. Before that we have a Revenge Squad to deal with. The revelation that Hank Henshaw is the mysterious leader of this new team is great and the fact that more of Superman's rogues are going to be joining this team has me thrilled. We're nearly a year into REBIRTH and it still feels fresh and exciting. Now bring on the bad guys. Art - 4: My only problem with the art in this book is that the faces of some of the characters, particularly Lois, looked a bit wonky from time to time. Not bad but something was off about them. Other than that, I have no complaints. Barberi and Santorelli made Superman's history seem fresh and vibrant and they did a fantastic job drawing the various looks of the Man of Steel from his DAY OF THE KRYPTON MAN suit to the armor he wore during KRISIS OF THE KRIMSON KRYPTONITE to his ELECTRIC BLUE look to his EXILE barbarian togs. This was a fun issue artistically and Barberi and Santorelli played a large part in taking what could be seen as an info dump and making it an engaging story. 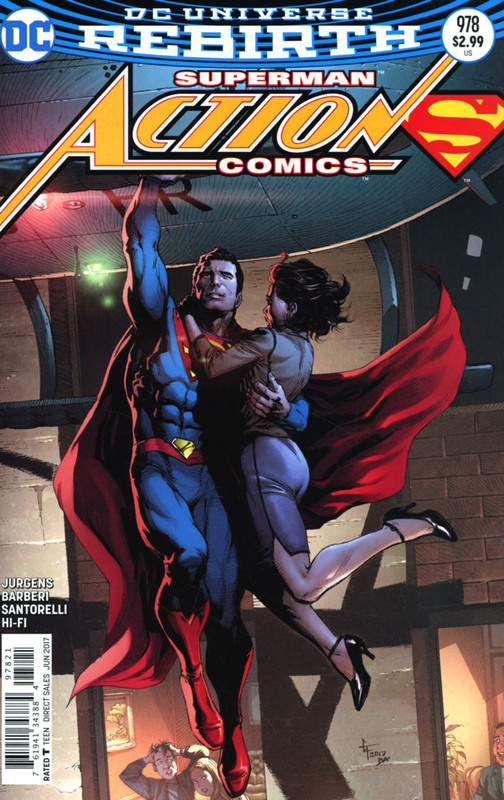 Cover Art - 4: Superman looks a little off but otherwise this is a great cover. At the risk of sounding like a broken record it is great to see Superman's Rogues Gallery coming back, even if it's just a cover. Seeing Silver Banshee was a real treat as I have long had a soft spot for her as a character. Variant Cover Art - 5: Back when Gary Frank was drawing ACTION COMICS I had a real problem with the way he kept drawing Superman and Clark to look like Christopher Reeve. Not sort of like Christopher Reeve but the actor as he portrayed Clark and Superman. It felt creepy but more than that it felt like we were taking a step back when it came to Superman instead of moving forward. You would think that since I felt that way that I wouldn't like this cover and yet I do. It's a great image and a great variant cover.